We’re Not Keeping This to Ourselves! Why do we still do VBS? It is one of the most important ways in which we invest in the spiritual formation of children. VBS forms relationships at all levels, from kitchen helpers to tech people, band members, child care workers, greeters and teachers. It’s a way to involve older youth in service and leadership: 78 middle and high school crew leaders were in charge of from three to five children each. VBS runs entirely on volunteers. There is nothing more gratifying than 163 youth and adults offering a week of their time to teach children about Jesus. These children are not only the future of the church, they are future of our world. How does VBS engage children and volunteers in their faith? 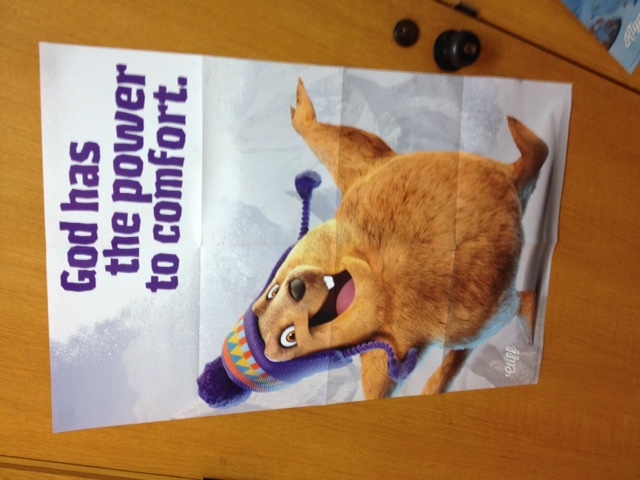 We used Group’s VBS program Everest: Conquering Challenges with God’s Mighty Power. 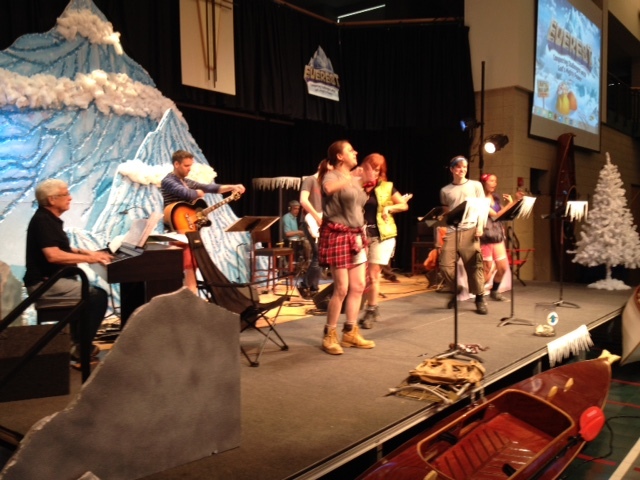 A live band with high energy, easy to sing, kid-centered Christian music draws children into the VBS experience. Every day has an easy-to-remember daily Bible point, Bible story and key verse. An enormous amount of time is spent making the church look like a base camp for Mount Everest. The sets can be as simple or elaborate as circumstances dictate. The VBS I fondly remember as a kid had no visuals at all, but today, being mindful of the various ways in which children learn is critical as well as highly effective. After VBS is over at noon, student crew leaders get a free lunch for the first three days. On Wednesday of VBS week, kids graduating from VBS by going into 6th grade build new relationships as they eat lunch and spend the afternoon on the church lawn playing various water games. As a mission opportunity, VBS kids bring money to buy Bibles for children in Thailand. Parents picking up their kids can “overhear” the gospel story during the last half hour by watching from the upper level. Why is Vacation Bible School such an effective outreach? Because we are called share God’s love, not keep it to ourselves! It’s natural for children to invite their friends, relatives and neighbors to Vacation Bible School, and it gives parents the gift of time to themselves every morning. 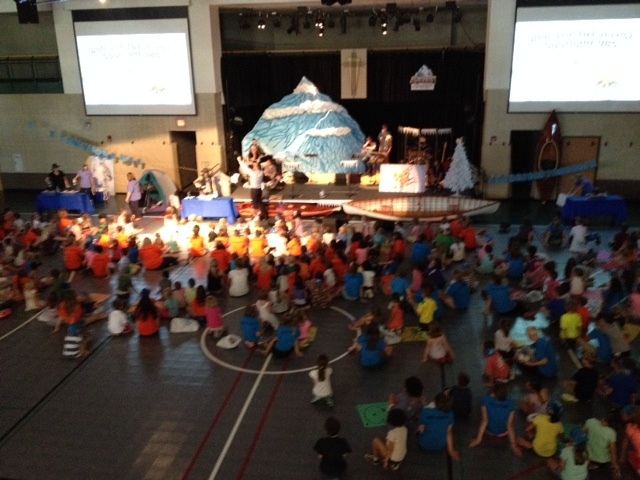 153 of our 300 VBS children were not from our church. VBS is a front door to the Christian faith. Parents may bring their children to VBS, but if it is a good experience, the children will insist on bringing their parents back to church to stay. Parents of VBS children connect with other parents, and when relationships form in a grace-filled environment, the Holy Spirit really goes to work! Parents and children are invited to worship the Sunday following VBS, where they sing and videos of the week are shown. Our videographer pulls several all-nighters. The time we devote to making Bible school relevant, fun and spiritual tugs at the hearts of parents, even if they do not currently attend church. How can your church do VBS? Virtually any church can do VBS. All you need is to make an intentional decision that your congregation wants to invest in children. Identify a few children either in your church, neighborhood or town. Pray for caring adults and youth who are willing to give of themselves to love the children and teach them about Jesus for a week in the summer. You don’t have to create VBS by yourself. A number of organizations provide outstanding materials. If there are no budgeted funds for VBS, invite an angel to purchase materials or borrow them from another church. And share them with other churches when you are done.